This can only be described as a masterclass in geopolitical trolling by the undisputed world champions, the notorious duo of Vovan and Lexus. 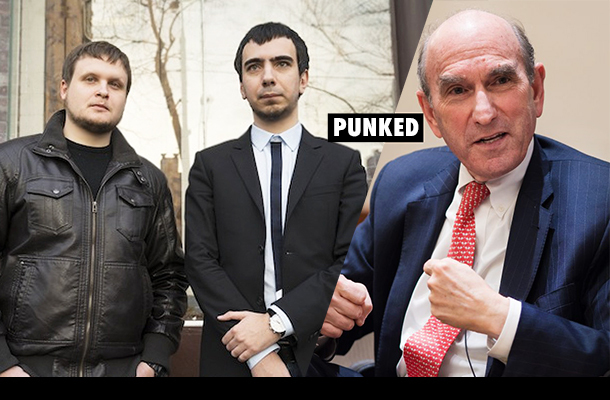 Following epic encounters with the likes of Nikki Haley, Petro Poroshenko, John McCain, and Elton John, the notorious Russia pranksters outdid themselves this time by showing up Washington’s new Special Representative for Venezuela, Elliot Abrams. Amazingly, despite their obvious Russian accent, the pair still managed to spoof a clueless US State Department gatekeepers and officials when posing as the President of the Swiss Confederation and the Head of the Department of Finance, Ueli Maurer. The call was said to have been made on February 19th, where they managed to convince a naive Abrams that they had frozen large sums of money belonging “Maduro’s inner circle” hidden in Swiss banks on accounts. The pair had Abrams believing they were prepared to give their newly seized multi-million dollar fortune to Washington’s hand-picked Venezuelan puppet “interim president” Juan Guaido, and even convinced Abrams to promise to supply them with ‘evidence’ of Maduro’s crimes. Incredibly, neoconservative holdover Abrams also delivered a veiled threat to the pranksters that the Swiss bank could be sued by Guaido’s “future government” as an accessory to handling ‘illegally gotten’ assets of Maduro’s inner circle which were supposedly ‘looted’ from Venezuela. Perhaps the ultimate coup in this exchange was when Elliot Abrams gave away the US strategy of bluffing military intervention against Venezuela. Abrams admitted to the pranksters that the US had no intention of deploying its military assets against the Maduro government, only to make Caracas believe they were serious by ‘talking tough’ as a psychological operation.